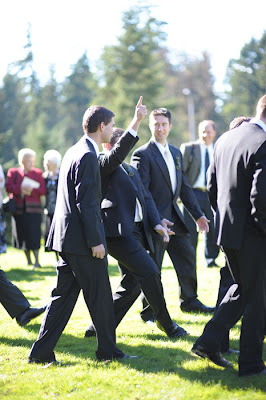 Getting shots of the groomsmen should be easy, right? There's no "Does my hair look flat? ", "Which pose will make me look the skinniest? ", or "Wait, I need more lipgloss!" (I may or may not be guilty of that last one). Kelli even managed to get them to stand in a nice line. Almost everyone is looking at the camera, and almost everyone has their hands in secret agent position. But then, she asked them to turn around and put their hands behind their back and chaos ensued! This is why only very nice people become photographers. Eventually all things were in order. Even the sun came out and said hello in this shot. 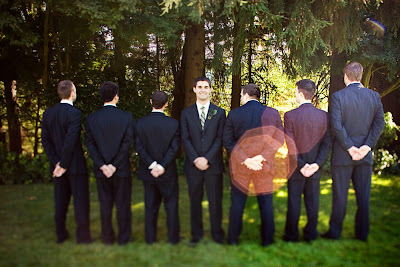 The Best Man wants to know why Kelli took a photo that directly highlights his bum. The words "sun flare" have no meaning to him. When moving from one spot to another look what happened! 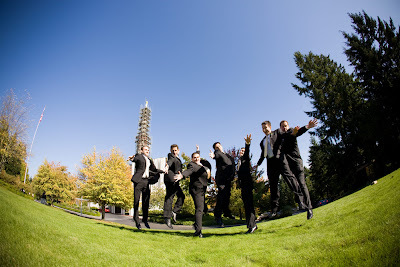 I admit, jumping pictures are becoming a bit cliche, but I love them because they help subjects loosen up a little bit. 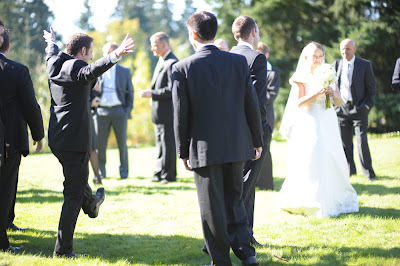 Usually jumping pictures full of a groom and groomsmen turn out really awesome (like the jumping shot in this post by Kelli Nicole), but the shot below is probably the worst jumping picture I have ever seen. And it was the best of the bunch! 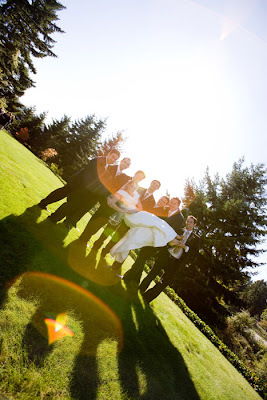 I don't know how it happened, but I managed to secure a position for myself in the "Cheesy Wedding Shot Hall of Fame". I am definitely the type of bride who likes to laugh at girls who do this and in the middle of the wedding day I became one of them! 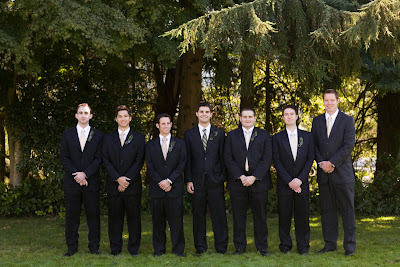 I received an email from my SIL in Poland (who was unable to make it to the wedding) where she said "I love your pictures, especially the one of you on the hands of many men!" On the hands of many men, indeed. 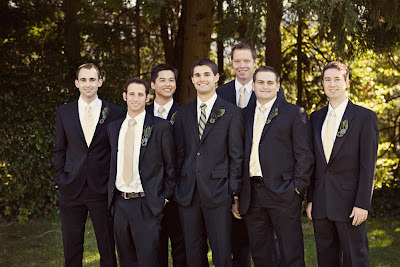 We never planned to have groomsmen shots happen like this (we were all supposed to meet up at the hotel and take a few groomsmen shots downtown, like the bridesmaid shots), but I realize now it doesn't matter that the two sets of photos don't match. 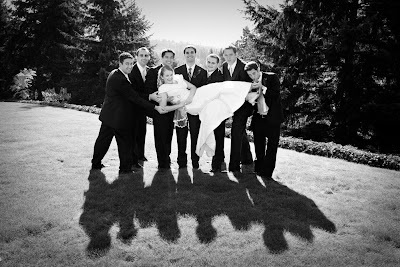 The shoot was short (which I'm sure the groomsmen loved) and then it was time to pack up and head over to the hotel to meet up with the bridesmaids for wedding party shots! There was a girl named Kelli Nicole. She took my photos. 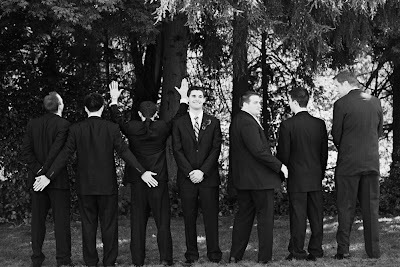 What is it about guys that they all do the secret man hand shot? 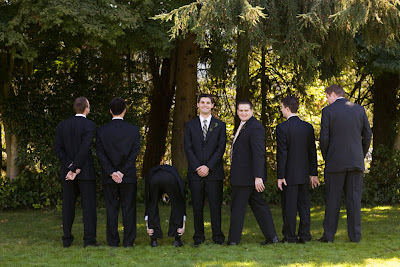 My guy always does that and after catching him the photographer made the other groomsmen do it to. It would have been no big deal only one of them had lost a finger in a high school shop class and he was obviously trying to hide that fact in pictures.